A favorite among American families, stuffed shells bring traditional Italian cooking to Western kitchens across the United States. Stuffed shells are typically filled with ricotta and other delicious cheeses, but they can also be stuffed with veggies and meats. If you want to know how to make stuffed shells the way Laura’s Grandma’ used to make, just watch this video and follow the steps as she explains. 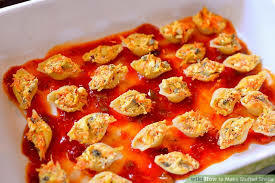 I remember growing up when at every function, especially at Church basement Wedding receptions there were Stuffed Shells. Church Basement Receptions were the order of the day back when I was a kid. I loved those weddings back then. They weren’t for show. They were celebrations of two kids getting together, committing to each other and starting a family. For whatever reason these were really popular for a while and still can be found at many Italian American gatherings. We haven’t made them at home for some time now, I really don’t know why. They’re really delicious but maybe now that I’m talking about them as we are….. we’ll re-visit and make stuffed shells in the next few weeks. 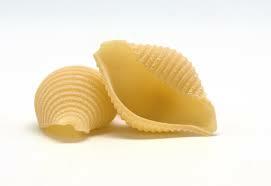 Conchiglie, commonly known as “shells” or “seashells” is a type of pasta. It is usually sold in the plain durum wheat variety, and also in colored varieties which use natural pigments, such as tomato extract, squid ink or spinach extract. 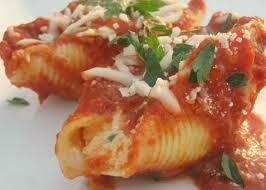 The shell shape of the pasta allows the sauce to adhere to it. A miniature variety called conchigliette is also available. The name derives from the Italian word for seashell (conchiglia). 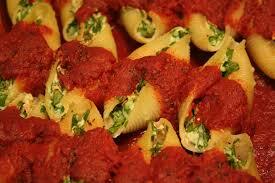 The Italian word conchiglie, and the English word “conch“, share the same Greek root which means “shell”.